You may not get the full scoop on how to manage your IVF medications in an office, but you can get the tips and tricks for handling them from these women on the front line of infertility. ART (also known as assisted reproductive technology) helps bring many new babies into the world—but like many of my in vitro fertilization (IVF) sisters, I never thought ART would become the only option available for me to become pregnant. And so, when I started with IVF meds, I didn't necessarily know what to expect—and I found plenty of surprises along my journey to motherhood. Before you embark on ART and IVF, here's some wisdom from the experts—including the moms who have been there. Most ART protocols require an intensive regimen of medications to facilitate egg production, build your uterine lining, prevent ovulation, and then a trigger shot. While it may seem completely overwhelming, it's imperative you stick to your prescription. According to Dr. Wendy Chang, scientific director of the Southern California Reproductive Center (SCRC), "the medication protocol your doctor selects for you has been tailored for your ovarian function, so taking them in a timely way is important." Setting text reminders or alarms can help you ensure you don't forget a dose. Most IVF medication protocols can run around $5000. (And that doesn't include the actual treatment!) But, what your physician doesn't always tell you is that there's likely free samples in their office! Katie Ferraro, MPH, RDN, CDE, recommends chatting with your doctor to see if there are any samples available to help offset the costs. 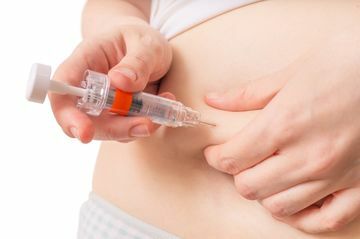 The initial FSH (commonly known as Follistim, Gonal-F or Bravelle) and LH (commonly known as dilute, micro HCG or Menopur) medications are overwhelming if you're not used to giving yourself injections. But, both medications are actually very easy to administer. Basically, you take three fingers and position them near your navel, grab that layer of "cushion" and gently insert the needle. On the first round of injections I felt a hot flash envelop my whole body, an atypical side effect that was likely stress induced. So, my key tip here, find your zen before administering the medication. I'd recommend administering at night when you can place a cool compress over the injection and rest. While preparing your body for baby, your physician may also recommend a progesterone regimen. A quick bio lesson—the body normally produces progesterone after ovulation. Since ART manipulates the normal cycle, most doctors put a patient on progesterone to help prepare the uterus for implantation. Progesterone can be either vaginal or intramuscular. "The vaginal preparations may be a tablet or gel," says Dr. Carolina Sueldo, REI specialist at IVF Florida Reproductive Associates. "There does not appear to be a difference in the chance of getting pregnant with one or the other." Fellow #IVFsister Susie Lemmer used vaginal progesterone in the form of Crinone gel, which you insert like a tampon. According to Lemmer, "My doctors warned me that it would be messy and to wear a pad. But, I wish I knew to insert and inject the gel vertically, then pull out the applicator at an angle. I've found that much more of the gel stays within you rather than on the applicator or falling out through the course of the day!" Having been on both vaginal and intramuscular progesterone, I can say this: The injections are terrible at first! An intramuscular injection uses an inch-long needle directly into your upper buttocks. Doctors will tell you there may be soreness at the injection site in addition to bruising and localized swelling, but they forget to inform you just HOW sore it truly will be! Icing prior to administering the injection helped ease the pain. Also, use a heating pad about 20 minutes after the injection. Once you get past the first week, it becomes more manageable. The worst part of the medication for me was the extreme constipation. Dr. Sueldo notes that constipation is a common complaint since "progesterone is a smooth muscle relaxant." Though you can take OTC remedies like milk of magnesia to ease your discomfort, they will often leave you feeling more nauseated than before. But there is something else you can do to help control your pain and the unfortunate constipation: Enter, nutrition! As a registered dietitian nutritionist, I totally believe in the power of food as a healing agent. Choosing a high-fiber diet, filled with fruits, vegetables, whole grains, plant-based proteins and plenty of water will help to ease your constipation. Plus, focusing on anti-inflammatory foods, like berries, dark leafy greens, and omega-3 boosting salmon, will help to decrease the inflammation you're experiencing while also enhancing your fertility. "Eating a nutritious diet, sleeping at least seven to eight hours nightly, and avoiding alcohol and other toxins and chemicals will improve your outcome," says Dr. Chang. While all of this may seem so confusing, I can promise you this: Every prick and puncture now will be worth it when you hold that beautiful baby in your arms.